The Nazis have taken a special interest in the Atlantis myth. Few adventure games actually feature much adventure. It’s a curious name for this, the most languid and cerebral of genres. But Indiana Jones and the Fate of Atlantis is a rare exception. Like the movies that inspired it—and the adventure serials that inspired them—it’s an exciting adventure in the truest sense. And it’s remarkable how they managed to squeeze this much energy out of a pretty standard point-and-click adventure game. The myth at the heart of this original Indiana Jones story is, as the title suggests, the fabled lost city of Atlantis. In 1939, on the eve of World War II, Indy finds a mysterious Atlantean artefact in the vast, unorganised collection of the college he teaches at between expeditions. The discovery of the object serves as the game’s comical prologue, where a bumbling Indy stumbles through the college archives and leaves a trail of destruction behind him. But, as is often the case at the beginning of an Indiana Jones story, the artefact is cruelly snatched away from him by Klaus Kerner, a pistol-wielding agent of the Third Reich. The Nazis have taken a special interest in the Atlantis myth, in particular a mystery metal called orichalchum that is said to generate an incredible amount of energy—energy the Nazis want to turn into a nuclear weapon. 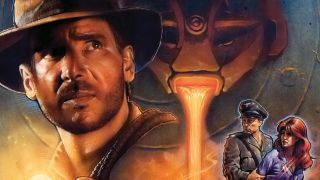 And so Indy embarks on a dangerous quest to stop them, because as we know from The Last Crusade, he really hates Nazis. Despite coming out well before some of LucasArts’ most famous games, Fate of Atlantis is one of the most innovative point-and-click adventures it ever released. There’s the IQ scoring system, which awards you bonus points if your solution to a puzzle is particularly imaginative. And some of the puzzle solutions are randomised too, making the game surprisingly replayable. But my favourite feature, which also adds to its replayability, is how the game is split into three distinctly flavoured paths: Fists, Wits, and Team. Early in the game Indy teams up with Sophia Hapgood, a selfprofessed psychic medium who claims to be in contact with the spirit of an Atlantean king. The pair were romantically involved once upon a time, and their relationship is similar to those of his female companions in the movies—more playful and sarcastic than romantic. Sophia has definite echoes of Marion Ravenwood. She’s tough, resourceful, and quick-witted, regularly putting Indy in his place. It’s refreshing (and surprising) to see a strong female character like this in a game, especially one from the early 1990s. If you choose the Team path you’ll spend the rest of the game with Sophia, solving puzzles together, trading barbs, and occasionally taking control of her. For me this is the most enjoyable way to play the game, simply because the interactions between the two characters are so much fun. The dialogue is sharp and funny and some of the puzzles involving both characters are well designed. But if you’d prefer to go solo, the Wits path sees Indy chasing Atlantis on his own, with trickier puzzles and, of course, less dialogue. You’ll visit many of the same locations in both paths, but they feel quite different. One of the most entertaining puzzles is found on the Team path, where Indy and Sophia try to steal an artefact from a snooty French professor by staging a séance. While Sophia conjures up the spirit of her Atlantean king, Indy combines a bedsheet, a flashlight, and a creepy mask to scare the professor out of the room, leaving the object behind. Meanwhile, on the Fists or Wits paths, you get involved in a car chase with some Nazis to retrieve the item. That’s more exciting, granted, but the séance is a great character moment. Then, finally, there’s the more action-focused Fists path, which is the one I would avoid—if only because it forces you to endure the game’s abysmal fighting minigames more often. While the opportunity to punch Nazis in a game is always welcome, actually beating someone up in Fate of Atlantis is a chore. You use a combination of key presses and mouse clicks to block and strike at different angles, but enemies are difficult to read and the controls just feel clunky and unsatisfying. However, some fights can be bypassed by solving puzzles, which in turn earns you more IQ points. One of the game’s greatest strengths is capturing the pulpy adventure feel of the films, but within the fairly rigid confines of a 1990s point-and-click adventure. One of the ways it does this is by never lingering in one location for too long. In the first couple of hours you’ll have visited New York City, Monte Carlo, Iceland, Guatemala, and the Azores. The changing scenery makes for an energetic, fast-paced game, helped by the dynamic iMuse soundtrack, which deftly incorporates John Williams’ iconic score. It looks fantastic too. The art is pretty low resolution by modern standards, and even compared to other LucasArts adventures released only a few years later. But each country Indy visits has a rich and distinctive atmosphere, tied together by a tastefully understated colour palette. Whether you’re exploring the frozen, overcast plains of Iceland, a bustling Algerian marketplace, or a Nazi U-boat, every location is rich with detail and personality. The character animation is wonderfully lively and expressive too, perfectly capturing the scrappy, rough and tumble action of Spielberg’s movies. But there are times when the game slips hopelessly into 1990s adventure game absurdity, which dampens the feeling of being Indiana Jones somewhat. One puzzle involves peeling some chewed gum off a school desk then sticking it to the bottoms of your shoes. Why? To walk up a coal chute, of course. I tried to imagine Indy doing this in the movies, but my brain simply couldn’t process it. But for the most part the puzzles are pretty logical and in keeping with the tone of the source material, particularly the ones involving activating ancient, arcane mechanisms and other such archaeological antics. As well as the aforementioned fighting system, there are some other, equally as maddening minigames. One involves flying over the desert in a balloon that is an absolute nightmare to control, and if I never have to play that part again in my life I’ll be happy. Luckily these are used quite sparingly and most of the game is in the classic adventure game mould: exploring, talking to people, combining items, and so on. This is about as vintage as point-and-click games get, with the classic verb buffet taking up half the screen, and an inventory that’s constantly filled with seemingly useless items. Fate of Atlantis is easy to get running on modern PCs thanks to its availability on digital platforms such as Steam and GOG. Just make sure you hit Alt+S when you start the game on Steam to disable the pixel smoothing filter, which is enabled by default. If you’re into adventure games you absolutely should play this. The randomised elements, IQ system, and multiple paths through the story set it apart from more straightforward adventure games of the era. The story and characters are engaging, the music is superb, it’s brilliantly paced, and it’s better than Kingdom of the Crystal Skull.